Journal analysis denotes evaluation, assessment, ranking, and scoring of a journal. It is an important exercise to be adopted by learning resource organization for recommending a journal for referring, scanning, referencing, subscribing, publishing, circulating, and disseminating purposes. Evaluation is done qualitatively in relation to content, objectives, and ethos. Rhetorical analysis of a journal will take into account something which is abstract and nonliteral. Advancement in ideology, in relation to different sphere of academic domains, is important key element of a particular journal. Journal which may communicate theory, practice, methods, skills, and thought process as a whole can reflect the image of an excellent journal. Analysis of these qualitative aspects should be part of the journal analysis. Quantitatively it can be ranked by modern tools which started as Science Citation Index and impact factor (IF) which then progressed to other numerical integers such as Eigenfactor score, Article Influence Score, and others. Numerical IFs have led to ranking system of journals and are based on “citations.” Can “citations” and its resultant statistics measure true impact of a journal? This article tries to share their viewpoint with discussion on various aspects of journal analysis. Introduction: Most patients go to dental offices nowadays looking for an esthetically pleasant smile, being stimulated by the esthetic patterns suggested by the society which associate a beautiful smile to success. The role of a dentist is to provide the best functional as well as esthetic restoration to the child as per his needs. Subjects and Methods: It is a questionnaire-based observational study. Questionnaire-based photographs (six in number) distributed among 400 parents who came with their children (<5 years) to the malls of Vadodara city. 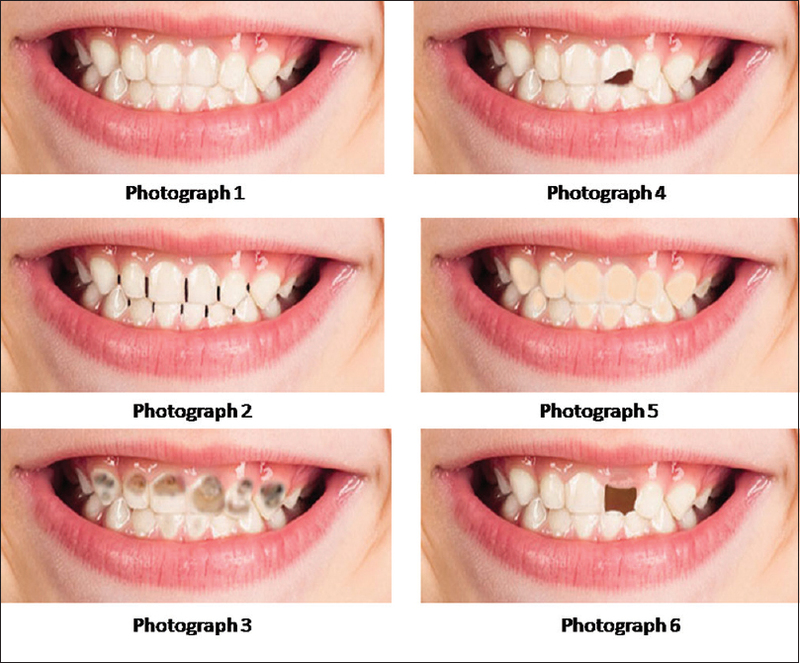 Each photograph showed different conditions of smile, namely, nonspaced dentition, spaced dentition, carious teeth, traumatic injury, teeth with plaque, and missing teeth. Each parent was asked to grade them in ascending order of appearance of the photographs as per their esthetic view. The parents were also asked to grade numerically from 1 to 6 in ascending order. Results: A descriptive statistical analysis was carried out in the present study. Results on continuous measurements were presented on mean ± standard deviation and results on categorical measurements were presented in number (%). Perception of esthetics given by parents with preference and position is as follows: nonspaced dentition, teeth with plaque, spaced dentition, traumatic injury, carious teeth, and missing teeth. Conclusions: It was concluded that parents are more concerned about the cleanliness and structure of their child's teeth which can create and play a role in esthetics. Objective: The objective of the study was to evaluate the knowledge and practice about adverse drug reactions (ADRs) among community pharmacists. Methods: A cross-sectional study was conducted with a questionnaire provided to 47 community pharmacists in Nadiad, Gujarat, India. Results: Nearly 75% response rate was noted as 35 pharmacists participated in the survey. Respondents were evaluated for their knowledge and practice of ADR reporting. For ADR reporting process, only 2.85% of pharmacists were familiar with Pharmacovigilance Programme of India (PvPI). Nearly 57% of participants reported ADR to physicians and 40% reported ADR to nonspecified sources. Around 51% of pharmacists replied that ADR reporting is professional obligation of pharmacists. Around 15% of pharmacists replied that ADRs do not require to be reported. Around 91.42% of pharmacists suggested advice to patients regarding the side effects of the drugs that may occur with the prescribed medicines. Conclusion: It may be concluded that community pharmacists have lower awareness regarding ADR reporting and importance of PvPI. This would reflect that the pharmacists have lack of knowledge about ADRs and their reporting. Therefore, government agencies and private institutes should develop strategies to spread the awareness regarding ADR reporting and its importance, which will be helpful to reduce the rate of underreporting. Background: Emerging concepts of interventions in diabetic diets should have been targeted to preserve health and nutritional status for the “living with disease philosophy.” Objective: In search of holistic dietary practice guidelines, the authors emphasized conceptual and contextual module for all levels of health-care providers for the optimum care of diabetics. Materials and Methods: Twenty-four research studies were identified from 45 potentially relevant databases and published literature to collate an updated idea of diabetic diet. Studies were selected on; first, all emerging nutritional plans and corresponding diets in diabetes mellitus among published literature were sketchily searched; second, “Diabetic diets” impacting disease control, retain health, and nutritional status affecting prognosis in downstream morbidities were identified; third, published reports from apex bodies of global importance such as American Diabetes Association, World Health Organization, Centre for Disease Control, Atlanta, USA, and others were given due weightage for their conceptual and contextual framework. Results: We have assembled diversity and novel concepts in diabetic diets, keeping tailor-made nutritional requirements as the mainstay in the philosophy of all-inclusive regimes for this chronic disease. There is a paucity of qualitative translational researches on diabetic diets and often limited to on paper suggestions and devoid of feedback on compliance from stakeholders. Conclusions: In a holistic approach, we require more research about diabetic diet; these are very useful in daily family medicine practices for the improvement in clinical approach and treatment in patients with diverse downstream morbidities of this complex entity. Introduction: The absolute bioavailability of carvedilol is ~25% - 35% even though it rapidly and extensively absorbed following oral administration due to a significant degree of presystemic metabolism. The purpose of this study was to develop controlled release mucoadhesive buccal bilayer tablet of carvedilol using HPMC K4M and carbomer 934 as the mucoadhesive polymer. Method: The formulation optimization was performed using 32 full factorial design to study the effect of independent variables viz. HPMC K4M (X1), carbomer 934 (X2) levels on % drug release in 8 h (Y1), mucoadhesive time (Y2) in buccal cavity and mucoadhesive strength (Y3). The tablets were evaluated for its appearance, thickness, diameter, weight uniformity, content uniformity, surface pH, swelling index and in vitro drug permeation. 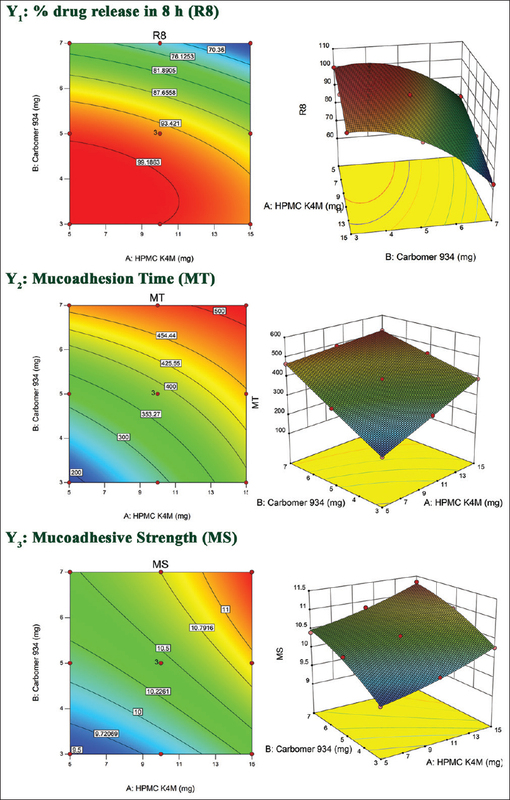 Results: The optimized formulation evaluated for responses which showed an in vitro drug release of 81.3% in 8 h, mucoadhesive strength 11.2 g with mucoadhesive time of 471.32 min and demonstrated case-II transport mechanism. The results of response variables were found to be very close with the predicted values. These results support the fact that 32 full factorial designs with desirability function could be effectively used in optimization of controlled release mucoadhesive buccal bilayer tablets. Conclusion: It can be concluded that buccal route can be one of the alternatives available to bypass the extensive hepatic first-pass metabolism and to improve the bioavailability of carvedilol. Introduction: Nipah virus (NiV) and Hendra virus are the type species of the highly pathogenic paramyxovirus genus Henipavirus, which can cause severe respiratory disease and fatal encephalitis infections in humans. NiV contains two envelope glycoproteins, the receptor-binding G glycoprotein (NiV-G) that facilitates attachment to host cells and the fusion (F) glycoprotein that mediates membrane merger. The attachment glycoprotein (NiV-G) on the surface of the virus is an important virulent factor and a promising antiviral target. In vitro, favipiravir inhibited Nipah and Hendra virus replication and transcriptionat micro molar concentrations. Experimental: In this study, we had designed ten bioisosteres of favipiravir containing pyrazine or quinoxaline moeity to identify novel inhibitors of Nipah virus using different in silico methods. The molecular docking studies were performed using iGEMDOCK2.1. Drug likeness of the compounds was predicted using SwissADME online tool. In silico toxicity studies were performed using ProTox-II. The comparison of in silico results were done with standard drug favipiravir. Results: In the docking studies, eight compounds showed significant inhibitory activity with low docking score as compare to standard drug. 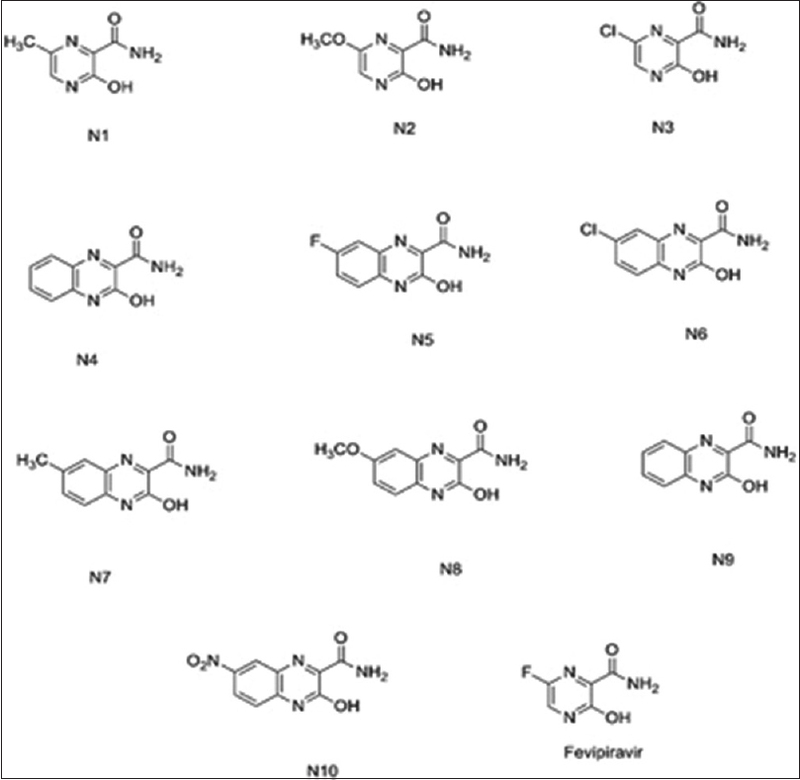 All the designed molecules had drug likeness properties and predicted to be nontoxic. Conclusion: These findings indicate that the novel bioisosteres of favipiravir have promising potential to target NiV-G/ephrin interactions to disrupt viral entry and provide the foundation for structure-based antiviral drug design. Background: Muscular flexibility is an essential aspect of normal human function. Flexibility can be gained by a variety of stretching techniques and other techniques, yet little work has been performed to compare these techniques. The objective of this study was to compare the effectiveness of muscle energy technique (MET) and positional release technique (PRT) on hamstring flexibility in healthy individual participants. Methods: Twenty-four healthy participants who met the inclusion criteria were randomly divided into two equal groups. Two groups following a home-based 2 weeks' (five 10 min sessions per week) hamstring stretching protocol (stretching performed by MET or by PRT). 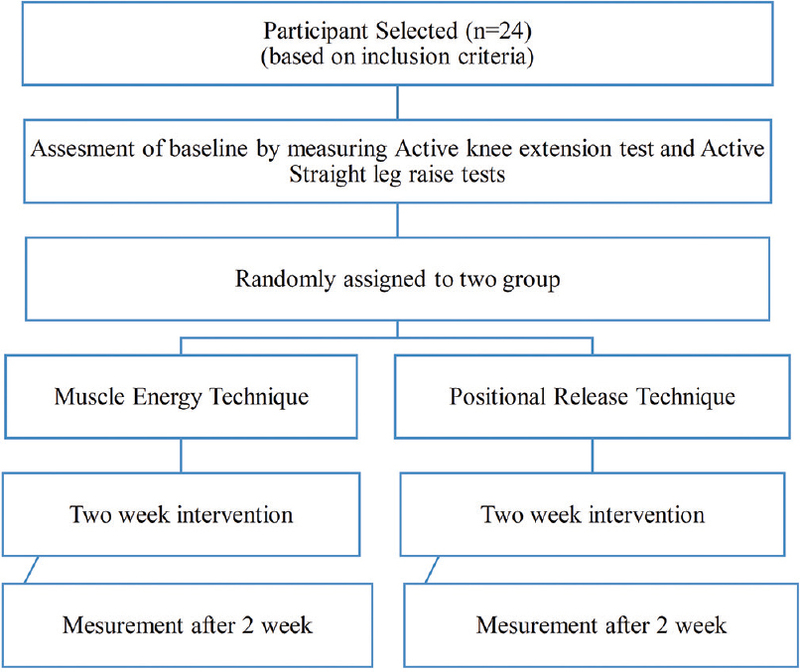 The range of motion (ROM) of knee extension was measured before and after stretching program by means of active knee extension test and active straight leg raise using universal goniometer. Results: There was a significant improvement in hamstring flexibility following the application of MET and PRT. However, increase in knee extension ROM was higher in MET compared to PRT. The change in the flexibility from the value at initial evaluation to after 2 weeks' intervention was also higher in the MET. Conclusion: The findings suggest that the MET is more effective than PRT for healthy individuals with normal and limited hamstring flexibility. Objective: To assess the relationship of mandibular third molar position and lower anterior crowding in adult patients. Methodology: A sample of 90 pretreatment casts were divided on the basis of lower third molar position into three groups: erupted, unerupted, and agenesis. Orthopantomograms and dental casts of all 90 samples were procured from the archives of department of orthodontics. The individual quantitative analytical registration of crowding was based on modified arch analysis proposed by Lundstorm. The length of the lower anterior segment was measured with the help of brass wire. Results: Chi-square test and ANOVA statistical tests revealed that there was no statistically significant difference in lower anterior crowding between the groups with erupted, unerupted, and agenesis of third molars on both right and left sides. Conclusion: The third molars do not create statistically significant difference in lower anterior crowding. The recommendation to extract lower third molar to minimize future anterior crowding is thus not justified. Vitamin B12 (Vit. B12) is an important cofactor for the cellular metabolism and myelination. Vit. B12 deficiency can manifest as hematological, neurological, or gastrointestinal (GI) abnormalities. The following case had a unique manifestation of Vit. B12 deficiency in the form of dysarthria without any evidence of hematological involvement. From this case, we can infer that, in young patients with isolated neurological manifestation, Vit. B12 deficiency can always be a differential diagnosis. A 26-year-old female presented with complaints of fever, odynophagia, and dysarthria. She was vitally stable and had no neurological deficits. Her blood investigations showed leukopenia and thrombocytopenia. She was positive for dengue immunoglobulin M, her Vit. B12 levels were low, and her hemoglobin electrophoresis was suggestive of sickle-cell trait. She was subjected to an upper GI endoscopy which was suggestive of antral gastritis. Her magnetic resonance imaging findings were within normal limits. Upon intravenous supplementation of Vit. B12, her dysarthria resolved. From the clinical course and investigation, we consider that dysarthria is an isolated neurological manifestation of Vit. B12 deficiency.